It is surprisingly easy to find oneself lost in a fog of illusion, created by nothing other than one’s own beliefs, and powerless to sift out truth from fantasy. The play M. Butterfly brings the Bouriscot scandal of 1986 to the stage with brilliant wit, diving into the memories of an emotionally tormented and delusional diplomat to explore self-deception and the desire that engenders it. M. Butterfly, written by David Henry Hwang, is based on a real-life affair between French diplomat Bernard Bouriscot and Chinese actor Shi Pei Pu. Known as one of the most shocking cases in the annals of diplomacy, the French diplomat finds out that his stunning, yet mysterious lover was, in fact, a male Chinese spy. This scandal of a white man and an Asian man has inspired artists for decades since. Their story is a gold mine of contrasts—between west and east, men and women, even capitalism and communism. It is clear Puccini’s famed opera Madame Butterfly was an inspiration for Hwang. The opera sings about the tragic love of a Japanese geisha who kills herself after being abandoned by her American husband. As the favorite opera of Rene Gallimard, the French diplomat in the play, Puccini’s opera is used to represent how he sees his lover, Song Liling. Rene calls Song his “butterfly,” while regarding himself as the powerful American soldier. Rene ultimately causes his own downfall, however, precisely because of this illusion he has created for himself. Through this plot twist, Hwang gives the audience a bitter shock and speaks of the stereotypes about the West and the East. 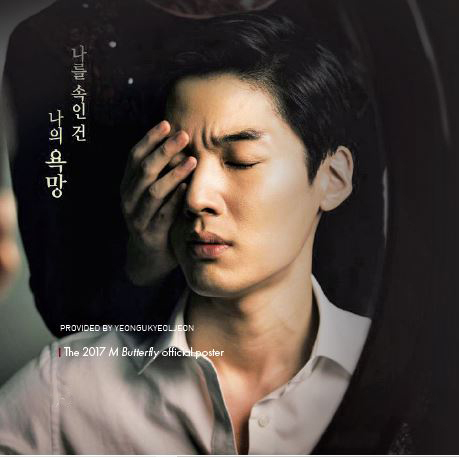 The 2017 M. Butterfly is the fourth revival in Korea. Since its premiere in 2012, the play has enjoyed a reputation as one of the most popular plays among Korea’s theatergoers. New artistic personnel were brought into this year’s performance: Kim Dong Yeon, director of Pride, Hamlet the play, is known for conveying tricky themes in masterfully audience-friendly ways; Kim Ju Hyun and Kim Do Bin from the Seoul Performing Arts Company take on the role of Rene Gallimard, the Frenchman in illusion, while Jang Yul and Oh Seung Hoon have been double-cast for Song Liling, the man of deception. Gallimard begins the play with a monologue on how his life ended up in despair. Even from the beginning, there are hints that his story does not have a happy ending, for his stage is set in a prison cell. However, how this lurid affair might end is not the point. What viewers need to seek is the underlying thoughts, as well as desires, that lead to the construction of Gallimard’s fantasy. Director Kim’s idea seems to be that only through a deep analysis of human nature and desire can M. Butterfly truly make its timeless message heard. The cast has accordingly honed their delivery to portray the subtle feelings and the hidden desires—be it sexual, emotional, or pragmatic—that lie within every interaction. Despite the limited space, the director’s clever usage of the stage settings helps the audience fully enjoy the play. While the play brings to life a wide array of source material and backgrounds—from Puccini’s opera to Chinese dance hall— the stage is designed in a way that seamlessly fits these different settings together. Moreover, this particular revival is made striking through its use of lights. Gallimard’s reminiscences have many time lapses of their own, and the scenes where he reminisces about his past are frequently interrupted by the present. For example, the shadow of bars serves as firm evidence that the time is now, and that his illusion is relatively contained. The spectacle of the last scene, where Gallimard delivers his last monologue, deserves special mention. Seeking a haven from pitiless reality, Gallimard undergoes a compelling transformation to forever unite with his fantasies. As he speaks his name, shadows of his cell, an image of a butterfly, and Chinese traditional patterns meet in a harmonious trinity upon his kneeling form. At the same time, another trinity descends—that of his words, his emotions, and his image—transformed perfectly into the butterfly of his dreams. Gallimard, the self-proclaimed victim, claims his own happy ending by choosing to stay with his imagination forever, while in reality, Boursicot chose to deny his love and finally claimed freedom after Shi’s death. One must wonder, however, whether the two Frenchmen’s endings to their long and wearying personal narratives—death in fantasy and life branded with traces of illusion—are truly liberating. However many revivals it goes through, M. Butterfly will continue to help audiences discover the looming shadow of their own Madame Butterfly’s wings.